“Let’s go the top.” I was feeling confident. “The top top.” After all, I had snowboarded on my own two feet just last weekend. No sit-ski. No tethering with worried instructors trying to keep me from hitting a tree. Just me and my snowboard and a pair of outriggers. And I totally ripped up the slopes. Well, technically “slope” (singular), and more specifically, the bottom third of the bunny hill, which is noted for having a pitch imperceptible to the naked eye. But still. I mean, the last time I had snowboarded was in the spring of 2009 on champagne snow, carving effortless turns on black diamond steeps. I was sure after last weekend that it was all coming back to me. I just needed a little vertical. “Dave, do you mean the top of the bunny slope?” My adaptive snowboard instructor, Nick, wasn’t so confident. His skeptical radar went off and an eyebrow raised. So I pleaded. He listened patiently. I pleaded some more. And then a wee bit more. He finally relented. In minutes I was riding the lift again with my wife, the only thing keeping me from smothering her with excited kisses was a terrified Nick sitting between us. Still, all was right in the world. And then we reached the top. I could remember the meandering blue diamond run with my eyes closed. Start left, drop down, hit the cat with some speed, scream under the lift popping turns left and right. There was just one problem—I opened my eyes. And before me was a run so steep that I might as well have just been dropped off onto the summit of an Alaskan mountain with a Warren Miller film crew about to document my epic descent. Four years can do a hell of a lot to your memory. The run started as I feared. Plunk. And the plunks kept on coming. Start, plunk. Turn, plunk. Hey, check out that other skier, plunk. Don’t film me honey, plunk. My lesson was scheduled to be two hours long. At this rate, we’d be lucky to be down before sunset. Nick informed me it was time for Plan B. Brilliant! I would feign injury (flash migraine, unrelenting Charlie horse, I could come up with a bunch) and I’d get ferried down in the bucket by ski patrol in time for dinner. Jesus. 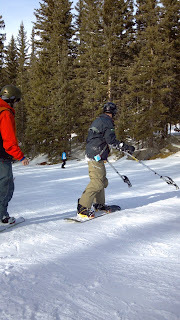 But Nick wasn’t going to let me down, nor let me continue to punish myself on slopes I clearly wasn’t yet ready for. When we got down to the bunny hill, with minutes to spare in my lesson, he let me go off again on my own, and I pulled a few turns before one more gnarly fall. As I stared into the sky, cataloguing my limbs (still there), I thought about the incredible day I just had. 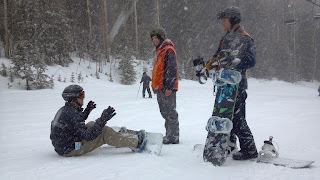 I was snowboarding, dammit! Now one could chalk this little victory up to my dogged determination or overwhelming willpower (or, let’s be honest, to Nick). But you’d be giving me far too much credit. Honestly, I believe we all have the power to conjure those resources when we really want to (well, except for the power of summoning Nick … and I imagine he’s now screening his calls). Heck, I found an MS snowboarding video on YouTube that features a woman who also had been off her board for four years—and she was killing it with far more panache than I. There will always be mountains with multiple sclerosis. And, fortunately, molehills. You might not conquer them all, but you’ll never ever reach a summit if you never ever try. Congratulations, and I especially like your closing line. Dave, this is so awesome!!! Congrats for getting back on the board! I know exactly that feeling of bliss, then frustration, then happiness again, but I always have to remind myself that at least I'm doing it. Bunny hill or not, you're doing it! Yay! Fantastic! We've just booked a last minute ski trip, the first in 2 years, the first since a couple of big relapses which led to diagnosis. Terrified but excited all at the same time. Dave, I am a new member(as of last night!) and am so glad I found you. And then I found this blog.....I have been taking adaptive ski lessons now for 4 years ( well, first year was ONE lesson, and three hours on the beloved bunny slope...one hour to get down it the first time...) I had only been skiing about 3 years before the MS ( undiagnosed at that point) made it too difficult to keep an edge, so I stopped. Long story how I even thought of giving it another go, but I did, and just finished a fantastic season on St. Paddy's Day weekend. Still have my smile on for what this has given back to me. I am so happy to find people with MS who really share this joy of winter and movement.....and use outriggers!! Loved what you wrote....can relate so much to it!! Wonderful, Veronica! So glad you are a part of ActiveMSers! I'm already looking forward to the winter of 2014. I'm going back to the top, and this time I'll get down a little faster! I can't wait for next season too... See you at the top ! If any of you other guys who read this are interested in snowboarding or skiing, the NSCD (National Sports Center for the Disabled) (nscd.org) operates out of Winter Park (winterparkresort.com). They're pretty baller, and whatever your balance/tone level, they can help you get out on the snow, whether it's just a transition to skiing (way easier on balance), the little pontoon skis, or if your legs are just jacked, sit skis. In the summer, there's also biking, horseback riding, rafting, and other activities if you're out this way.